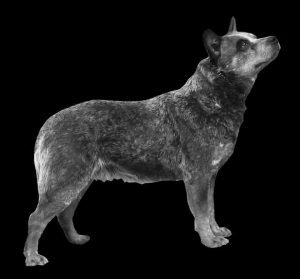 During the first half of the twentieth century Robert Kaleski was the great authority on the Australian Cattle Dog breed and, as time went by, questioning his authority amounted to heresy. Kaleski, however, developed a breed mythology (ADCB p.22-26, 139-140). The Dalmatian myth has proven particularly resistant. 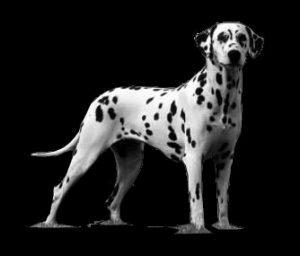 Setting aside the various discussions in ADBC, visual evidence questions the Dalmatian ancestor. Basic coat colour in ACDs is a spectrum from black to white in blue ACDs, and from red to white in red ACDs. Between the two end-members are various mixtures black (or red) and white and varying proportions of coloured to white hairs. The speckled or mottled colour, characteristic of ACDs, is controlled by the Ticking gene. Some ACDs, such as the dog in the second photo, show a range of colour/white distribution from even blue (or red) to mottled. There is no white/colour gradation in Dalmatians. It’s complete speculation, but imagine yourself at a dog show in the early 1920s. Kaleski is there, ring-side, making free with his opinion of the ACD exhibits to a group of admirers. 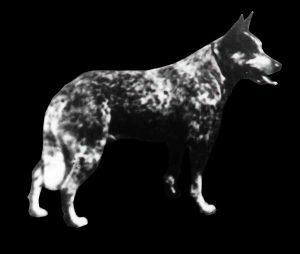 Someone asks: “Mr Kaleski, why are Cattle Dogs sort of spotted?” Kaleski invents the Dalmatian ancestor on the spot, and so the myth was born. This entry was posted in ACD Coat Colour, Uncategorized. Bookmark the permalink. I can remember when I was new to the ACD, and those in the know overwhelmingly recommended Kaleski’s book for the knowledge I would gain from it. I found an old one and paid more for that book than I did for my first 2 ACDs. He made some good observations, gave a reasonable shot at providing history, and bluffed his way through the rest. It’s rather like what one can overhear these days at shows, and I wonder how contentious things may have been in person at those shows in Kaleski’s day or if it’s just as it is now, with comments and slurs delivered via media. I still reread his book from time to time, but the Dalmatian part didn’t fit when he proclaimed it, nor does it now. I direct people to Noreen’s book first. Hearsay and folklore are so much more entertaining than observation and reason. I wrote A Dog Called Blue in the hope of showing that Kaleski’s writings after around 1920 were flights of fancy – but it hasn’t worked! According to Dr Helen Hewson-Fruend, on p.136 of Noreen’s book, the Roan gene doesn’t operate in ACDs so it is incorrect and misleading to describe them as “roan”. The Ticking gene does operate. It gives us white pups at birth, pups that are ticked, speckled or mottled as they grow older and a coat colour “spectrum” from almost solid colour to white that Noreen describes in her blog and shows in her choice of photos. OK so she didn’t show photos of solid colour or white but I’m sure she could! 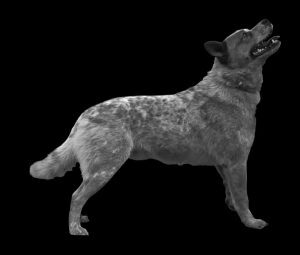 I remember reading where Kaleski stated that the “red cattle dog” came from crossing with foxes! Given this and the personality of the man, I don’t see how we can believe anything he says. But right now, there is a big discussion going on colour patterns…blue or red vs speckle vs mottle. Is there a difference between a blue or red roan and a blue or red speckle? And when does a speckle become a mottle? Some dogs have combinations of patterns on their coats. And the coats colours change from puppies to adults, too. Iris Heale was my mentor with purebred ACDs. She would regale me with stories of her conversations with Mr Kaleski, or more like when he ‘instruct’ her in the world of ACDs, ringside at the Sydney Royal. Some of the comments Mr Kaleski made that she shared with me did seem a bit far-fetched, even to this newcomer to the purebred fraternity. He also had a great aversion to GSDs and would call them ‘wolf dogs’ and implied they were a very dangerous breed. I believe there was a time in Australia’s history where the importation of GSDs was banned. I did have the opportunity to read some of his letters to Iris and have often wondered if they were carefully archived after her passing. But as for Mr Kaleski and his ideas, I have always taken read with a cautious mind. Interesting, Kath. I spent many hours with Iris when I was researching for my book but never a word did she say about Kaleski. Except for within the dog fancy Kaleski was unknown until the 1910s when his articles were published by the NSW Department of Agriculture. Up to this time, I think Kaleski was reliable except for his insistance that Halls Heelers were brought to Sydney from the Hunter Valley. Even though Thomas Hall lived in the Hunter Valley at Dartbrook, the family base was in Pitt Town, in the Hawkesbury Valley west of Sydney. The Halls also owned holding paddocks close to the Glebe Island abattoirs, in what is now the Sydney suburb of Auburn. One would expect that Halls Heelers were used for droving between the Hawkesbury Valley and Auburn. GSDs were prohibited imports to Australia from around 1928 to 1972 although there were illegals. I don’t know whether Kaleski was in any way involved. I can well imagine that conversation having taken place at a ringside! FORM AND FUNCTION 1: THE BASIC DOG.